Choosing products for your renovation project can be difficult simply because there are so many products to choose from. Just visit the faucet section in a home center and the number of choices can be dizzying. In order to compete in the market, a lot of manufacturers will introduce new features and trends to give their products the new and shiny feel. Some of these new features are really great and some…well…not so much. Here are 5 products you should add to your renovation and 5 that you should avoid. Although granite sinks have been around for a bit, we are starting to see off brand manufacturers produce them as well. 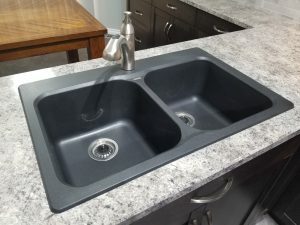 If you like the look of a granite sink, they can add a striking look to your kitchen. For our projects, we use Blanco sinks that can be either top mount or under mount installed. They are generally available in black, chocolate or gray, but other colors can be special ordered. I personally would avoid the white granite sinks. Although scuff marks can be taken out fairly easily, they do show more often in a white sink. Avoid: Bronze taps or shower fixtures. 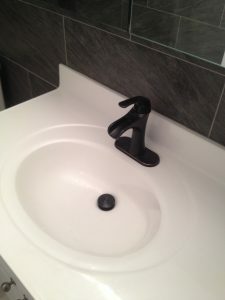 The oil rubbed bronze look has also been around for awhile but we’ve been seeing a small trend of clients requesting them for their sink and shower faucets. Although they look great out of the box, they can look not-so-hot after a few uses. This is actually not through the fault of the product, but the conditions in which they’re placed. You see, here in Edmonton, our water is quite hard, and hard water tends to leave water stains that are really easy to see on the dark surfaces of the bronze. If you like spending time wiping down your taps after each use, then hey, no worries. Otherwise they may not look that great from daily use. A shower bar is is a great add for any shower. The shower bar is mounted to the wall and the shower head fits in a cradle that can be raised and lowered. The benefits of having one can be clearly seen if you have people in your home who are of significantly different heights. No longer do tall people have to duck to get their hair wet or short people have constantly get a blast of water in the face. 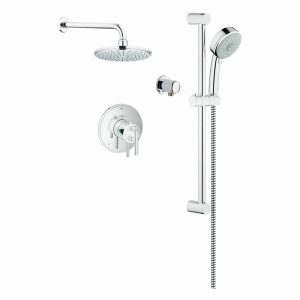 Featured in the picture is the Grohe Timeless THM Dual Function shower kit that also comes with a rain head…another nice feature for a shower. Avoid: Touch-less taps or toilets. Now I know that some people will disagree with me on this one, but hear me out. Have you ever been to a public restroom with touch-less toilets and taps. The sensors in the toilets are generally good, but they hardly look like they would belong in a residential bathroom. As far as taps go , however, I hate standing there waving my soapy hands under a set of taps and not getting any water. I swear, it happens to me about 50% of the time. Any when I do get water, it runs for about 3 seconds and then shuts off, usually meaning it doesn’t run long enough to get any hot water. I’m just not convinced that the technology is good enough for use in your home. The other issue I see with touch-less toilets is an issue called ‘ghost flushing’. Sometimes the sensors don’t work like they should and the toilet will flush with no one around. I don’t know about you, but I don’t think I would get a lot of sleep if my toilet flushed in the middle of the night while everyone was in bed. I’d be wondering if a burglar had decided to try out one of these fancy touch-less toilets. A huge trend that we’ve been seeing as of the last couple years is getting rid of a bathtub in favor of putting in a walk-in shower. If you’re at all like me, you rarely (if ever) take a bath and prefer to take a shower. Climbing in and out of a tub can be a potential for slipping and hurting yourself, especially as you age. With a desire for people to stay in their homes as they age, a walk-in shower makes a lot of sense. 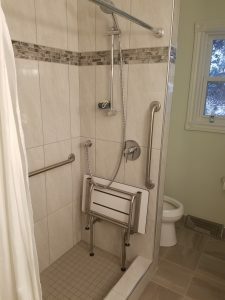 The shower featured here was put in place of a tub and also includes some accessibility features, such as stainless steel grab bars and a phenolic resin fold up shower seat. Avoid: Grey, grey and more grey. Okay, this one is another personal opinion. Although having grey counter tops, grey flooring and grey walls has been a trend for the last few years, I don’t like grey. I have nothing against anyone who decides to use a lot of grey tones in their project, but I find the cold tones to really affect my mood. Here in Edmonton, during the winter months, the skies are often overcast and we don’t receive a lot of sunlight. I much prefer warm tones (or even bold colors) over neutral ones. If you are going with grey, consider adding a touch of color either with elements of the project or with accessories.